لیکوود (به انگلیسی: Lakewood Township) شهری در ایالت نیوجرسی کشور ایالات متحده آمریکا است که جمعیت آن در سرشماری سال ۲۰۱۰ میلادی، ۹۲٬۸۴۳ نفر بوده‌است. ↑ Committee Members, Lakewood Township. Accessed January 2, 2013. ↑ 2012 New Jersey Mayors Directory, New Jersey Department of Community Affairs, dated August 9, 2012. Accessed January 2, 2013. As of date accessed, Menashe Miller is listed as mayor with a term-end date of December 31, 2012. ↑ Municipal Manager, Township of Lakewood. Accessed August 20, 2012. ↑ Township Clerk, Township of Lakewood. Accessed August 20, 2012. ↑ 2012 New Jersey Legislative District Data Book, دانشگاه راتگرز Edward J. Bloustein School of Planning and Public Policy, March 2013, p. 103. 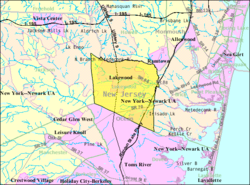 ↑ U.S. Geological Survey Geographic Names Information System: Township of Lakewood, Geographic Names Information System, accessed January 4, 2008. ↑ DP-1 - Profile of General Population and Housing Characteristics: 2010 for Lakewood township, Ocean County, New Jersey, اداره آمار آمریکا. Accessed January 3, 2012. ↑ Table DP-1. Profile of General Demographic Characteristics: 2010 for Lakewood township, New Jersey Department of Labor and Workforce Development. Accessed January 3, 2012. ↑ Look Up a ZIP Code, خدمات پستی ایالات متحده آمریکا. Accessed September 5, 2011. ↑ A Cure for the Common Codes: New Jersey, Missouri Census Data Center. Accessed August 20, 2012. این صفحه آخرین‌بار در ‏۲۷ مهٔ ۲۰۱۸ ساعت ‏۱۰:۴۰ ویرایش شده‌است.